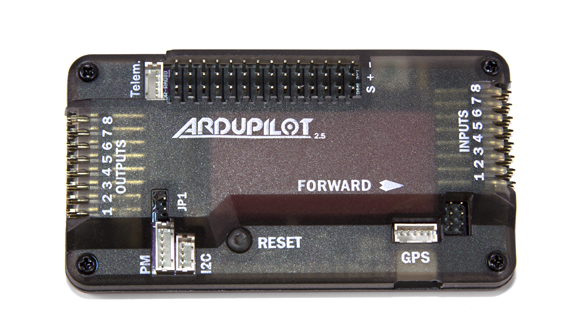 Ardupilot Mega (APM) is a professional quality IMU autopilot that is based on the Arduino Mega platform. This autopilot can control fixed-wing aircraft, multi-rotor helicopters, as well as traditional helicopters. It is a full autopilot capable for autonomous stabilisation, way-point based navigation and two way telemetry with Xbee wireless modules. Supporting 8 RC channels with 4 serial ports. ArduPilot Mega consists of the main processor board (red one above) and the IMU shield which fits above or below it (shown mounted together below). The open source control software is constantly being updated with new and improved features by a team of about 30 core developers, supported by a community of over 10000 members. Free open source autopilot firmware that supports planes, multicopters (tri, quad, hex, oct, etc), traditional helicopters and ground rovers! Choice of free Ground Stations, including the state-of-the-art HK GCS, which includes mission planning, in-air parameter setting, on-board video display, voice synthesis, and full datalogging with replay. The ArduPilot Mega Mission Planner allows you to easily plan mission, or upload new firmware with only a few clicks of the mouse, enabling any user to easily get started. With the addition of a Telemetry Kit, you can track your UAV in real time, or even change your mission while your ArduPilot Mega powered UAV is in the air. This is the physical boards that contain the sensors and processors. The hardware can be thought of as the little PC that runs the autopilot software. Official APM hardware available to buy from Unmanned Tech in the UK. There are also are many other compatible boards (and also clones) but for the best experience its best to buy official ardupilot boards. The firmware is the code that runs on the board. There are many different firmware bases to choose from. Depending on what code you load, you can use the APM to control fixed wing aircraft, multi rotors, helicopters and also ground rovers. APM software is the program that runs on your PC, it is used to load the firmware, and change the settings on your APM board. 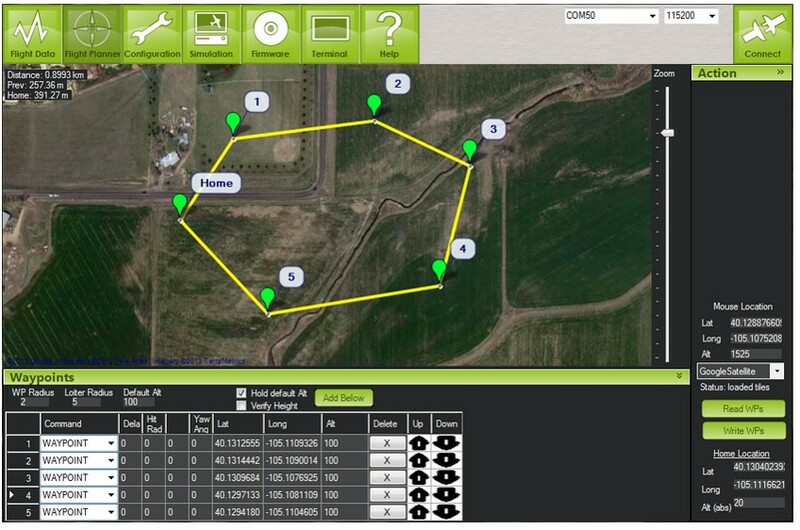 You can also use this software to plan missions and monitor your drone on the map. ArduPlane is the fixed wing UAV code branch of the project. This software is designed for fixed wing UAV's that can range from flying wings to traditional aircraft, or anything in between.